Several people have asked about the Dhammapada readings at our Saturday morning meditation sessions. You can learn more about the translation by Gil Fronsdal, including free audio readings and links to where you can purchase the book, at Insight Meditation Center (HERE). 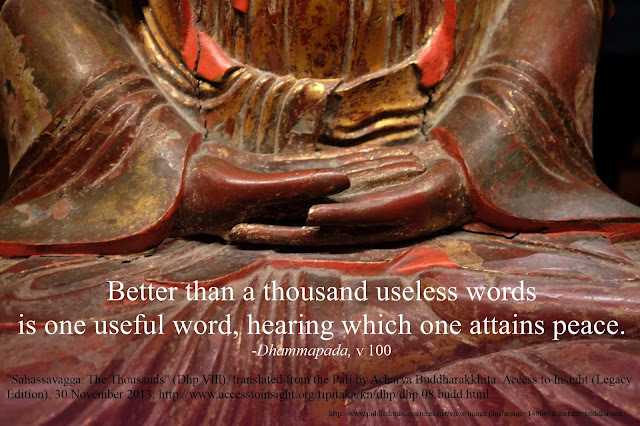 You can find two translations, by Buddharakkhita and Thanissaro, at Access to Insight (HERE). Another translation, by Daw Mya Tin, includes summaries of traditional stories associated with the Dhammapada verses, "generally believed [to be] written by Buddhaghosa (5th century A.D.)" (HERE). Finally, Ajahn Munindo has offered a translation, A Dhammapada for Contemplation (HERE), as well as two collections of reflections on verses from the Dhammapada (vol 1, vol 2).